UPDATE SUMMER 2014: this recipe makes ready to drink iced coffee, NOT a concentrate. for a concentrate, simply follow the same procedure but use 1/3 cup coffee beans (whole) to 1 1/2 cups of water. i'm putting my coffee snob hat back on today to teach you about a little secret: cold press iced coffee. iced coffee gets a bad name for itself, with its watered down wimpy taste, but not cold press. it's magical, smooth and delicious. black gold. cold press coffee is brewed cold for a long period of time so it's never hot and never needs ice. this is the way caribou makes their iced coffee and it's a trade secret i've never forgotten! 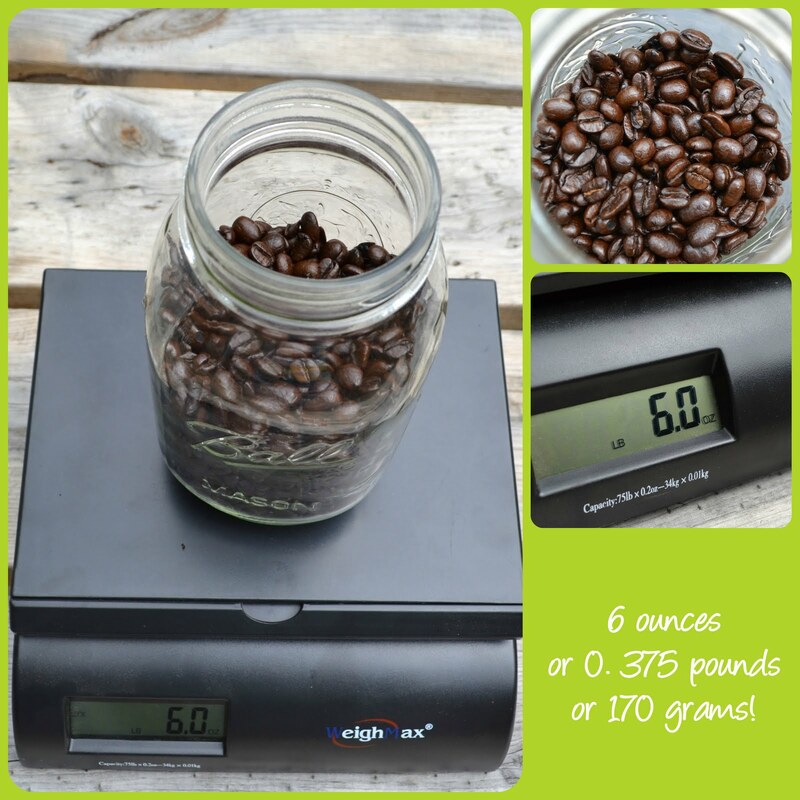 weigh out your coffee. i use my trusty postal scale. add a jar or bowl and then zero out the scale. you'll need six ounces of coffee. aren't those beans just beautiful? set your grinder to coarse and grind up your beans. you'll end up with big beautiful coarse pieces of coffee. dump the coffee into your one gallon pitcher. add enough water to cover the grinds & stir the mixture. fill the pitcher with water. you want to make sure the water goes all the way to the one gallon line, so the coffee will come to the very top of the pitcher. cover the mixture & set it out on your counter for 12-16 hours. less than 12 hours and the coffee won't have its full flavor. more than 16 and it will start to taste bitter. this does not need to be refrigerated but shouldn't be left in the sun. wait patiently for 12-16 hours. if you're smarter than me you'll make this at night and spend most of that time happily asleep. i was not so smart, so i had to strain my coffee at 2:00am. i'm sorry for the terrible pictures! after 12 hours, a lot of the coffee will have floated to the top. use a giant spoon and remove as much of it as you can. once you touch the mound of grinds with the spoon, they will start to settle back to the bottom, so you only have one shot to get as much as you can! pour the rest of your sludgy mixture through a metal coffee filter into your second one gallon pitcher. this part is tricky to photograph and do all at the same time and since this was 2:00 am my usual photographer was fast asleep! i also didn't yet own two one gallon pitchers so there was a lot of container shuffling. basically a giant mess. here it is in all its glory! cold press iced coffee. store it in an airtight container (caribou uses this one and we do too!) in your fridge & enjoy! cold press iced coffee tastes best when enjoyed black. drunk from a mason jar. with a green straw. also delicious: half & half and a little bit of white chocolate syrup. linked up here & here!